Facebook fan Brian let us know that Chino Hills’ FireSword Mongolian Grill had closed. The eatery had decent enough reviews on Yelp, most of which were five stars. The owners posted a very classy farewell on the restaurant’s website (which went dark a few days ago), thanking customers for choosing to visit. In part: “While there is no joy in our hearts to say goodbye, we will always remember the smiles, the happy visitors, being included in all the special events you celebrated with us, and the many buttons we helped pop off pants from the amazing food you experienced with us. In other words, we’ll miss you.” FireSword was at 4200 Chino Hills Parkway, Suite 115. In Palm Springs, one of our go-to Mexican places — La Casita — at 100 S. Indian Canyon Drive, has closed. In its place will be another outlet of Thai Smile. It appears that the Beaumont La Casita remains open. We’re fans of Flame Broiler, and we were excited when we saw a new location (somewhat) close to home. The Redlands location apparently opened back in August, but we just discovered it a couple of weeks ago. It’s at 1599 W. Redlands Blvd., where a Starbucks once was. Miguel’s Jr. continues to expand. My brother, who lives in Moreno Valley, tipped me that the small-but-growing Inland Empire-based chain recently opened a new location at 12860 Day St. For a while, it appeared they would be moving in next to the new In-N-Out in Rialto, but now it seems that spot is going to Chipotle. Also in Moreno Valley, in the spot (12625 Frederick St.) once held by Red Robin, then briefly by the Village Cafe, will soon be Polly’s Pies. The location already has its own Facebook page and Twitter account. For updates, click here. 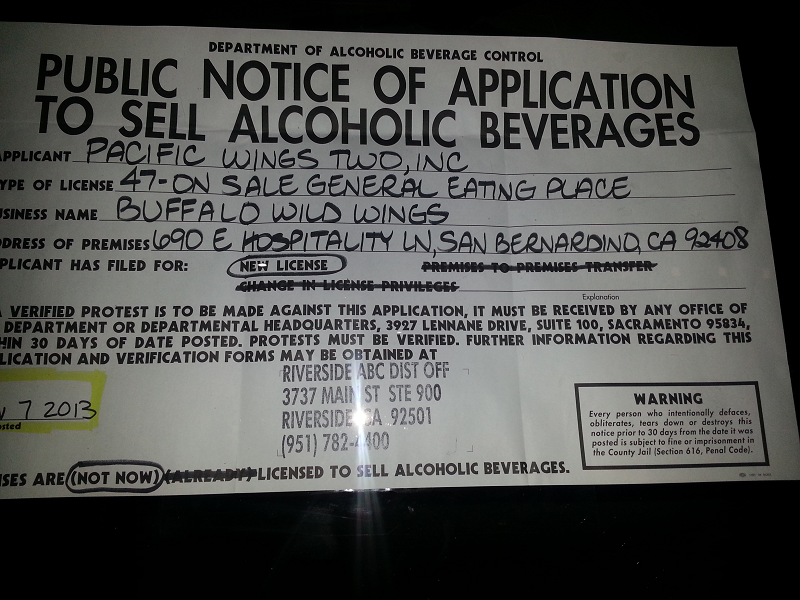 Facebook fan Danny messaged us to let us know that he saw an ad online that Buffalo Wild Wings was looking for managers for its San Bernardino location, and pointed us to his obvious choice for that location: The former Pat & Oscars/O’s American Kitchen, 690 E. Hospitality Lane. Turns out he was right on the money. Drove by the location last night and found this ABC notice posted inside the front door. We stumbled across an online ad that Italian beef sandwich chain Al’s Beef was opening in Chino and was doing interviews for employment. Al’s will take over the former SanSai Japanese Grill location at 4021 Grand Ave., Suite A. Looks like there’s another Flame Broiler in the works at 6205 Pat’s Ranch Road, Suite A, Mira Loma. I had reports from a couple Daily Bulletin staffers that Grill It Teriyaki House is moving into the spot that used to be Donut Star/Star Wok Express, 1635 E. Fourth St., Ontario. 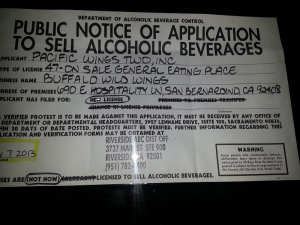 It appears that the restaurant is related to Just Grill It, which has locations in Victorville and Barstow. See any changes in your neck of the Inland Empire? Let us know by leaving a comment below, or reaching out on Twitter, Facebook or Google+. This entry was posted in Chino, Chino Hills, Mira Loma, Moreno Valley, Palm Springs, Redlands, San Bernardino, Upland and tagged closings, openings by John Plessel. Bookmark the permalink.